Salil composed some of his most formidable melodies in this film. From the symphonic composition like 'Raato.n ke saaye' rumoured to be inspired by a Chopin's piece to the complex chord progression in 'Guzar jaaye din' and the exquisite counterpoint of "Nain hamaare". 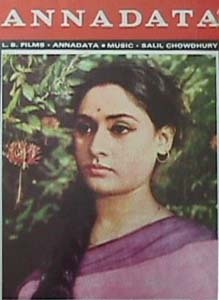 Also, the unusual harmony in 'Champabati aja' and the unforgettable melody and rich orchestration in "Jiyaa laage naa". It is well known that it took Kishore a number of 'takes' before he could finally record "Guzar jaaye din" ! At least he did it. Fortunately HMV has finally released a CD of Annadata which also contains the Title Music and some exquisite background music.